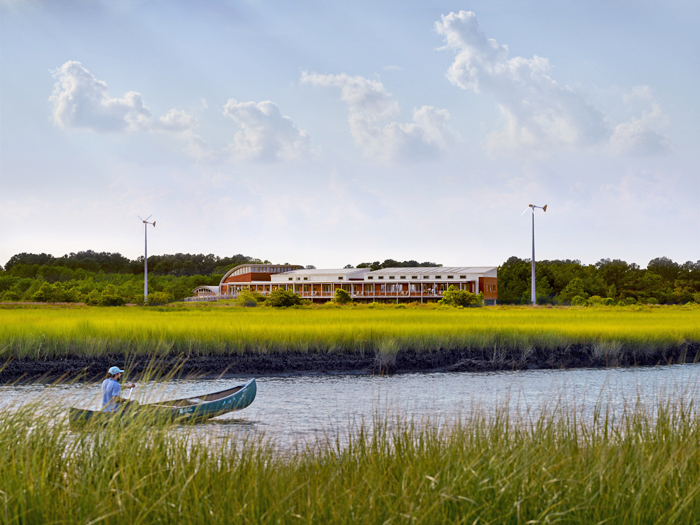 View of the Brock Center from the marshes and Bay to the South. Students and residents can access the waterways to develop a deeper understanding of the Bay's threatened ecosystems. Photo Prakash Patel Photography, courtesy of SmithGroupJJR. The Brock Environmental Center serves as the hub for the Chesapeake Bay Foundation's (CBF) Hampton Road office and supports their education, outreach, advocacy, and restoration initiatives. In addition to offices for CBF and partner groups, the Center provides meeting rooms and an 80–seat conference room designed to express CBF's mission of collaboration to protect one of the nation's most valuable and threatened natural resources — the Chesapeake Bay. Outdoor spaces, including a prominent outdoor classroom that hosts thousands of K–12 students each year, allow for a reduction in built area and connect occupants to the site. Upon arriving on foot from the West, the building's expressive forms and prominent outdoor education pavilion are revealed, reinforcing the Center's mission. Completion of the Center at the end of 2014 concluded a successful community effort to save Virginia Beach's 118–acre Pleasure House Point tract from development. As recently as 2008, developers intended to build more than 1,100 new high-rise condos and townhouses on the property. The economic downturn in 2009 led to bank foreclosure of the property. A community partnership with CBF, the City of Virginia Beach, and the Trust for Public Land purchased the land from the bank in 2012, preserving it for open space and environmental education. The new Center, the only major structure on the entire 118 acres, takes up only one-half acre of CBF's 10–acre parcel. Preserving the local ecology and water quality was paramount upon development of the site. Locating the Center on an ecologically-sensitive site allowed CBF to implement its advocacy, restoration, and education efforts in one location, but also necessitated appropriate environmental goals: to protect, preserve, and celebrate this setting, creating a design of its place, while simultaneously showcasing technologies that contribute to Net-Zero Energy, Water, and Waste. CBF also understood that a building can influence the public to embrace sustainable development, having witnessed the broad impact that their game-changing headquarters, the Merrill Center, had on society. As such, they envisioned the Center would manifest the highest aspirations of sustainability, creating a project that transcends notions of "doing less harm" towards a reality where a project can create a positive, regenerative impact on both the environment and society. Secure/Safe Goal: According to NOAA, the Hampton Roads area in Virginia is experiencing the highest rates of sea-level rise along the entire U.S. East Coast. Second only to New Orleans, Hampton Roads contains the largest population center in the US at risk from sea-level rise. Situated on a coastal site entirely within the 100–year flood plain, in a hurricane prone region, the project sought to embody resilient design ensuring its ability to resist natural and man-made hazards. Goals included creating an enduring, safe-haven for the neighboring community, and a replicable example of resilient development in the region. Sustainable Goal: CBF again pursued the goal of creating no less than the greenest building possible. The team identified both LEED Platinum certification and the strict standards of the Living Building Challenge (LBC), a green building certification program promulgated by the International Living Future Institute that defines the most advanced measure of sustainability possible today. LBC certified projects are required to demonstrate that they have a "net-positive" impact on the environment. Functional Goal: The Brock Center must not only be environmentally sustainable, but must do so in a way that doesn't compromise function or comfort. CBF had a parallel goal to create the best quality environment for staff, which promotes collaboration and effective advocacy and research. Additionally, since educating the public on the Chesapeake Bay's ecosystems is a pillar of their mission, a functional need was to create a place to host and attract visitors and enact their outdoor education program. Accessible Goal: As required by the LBC, effortless accessibility for all was a guiding design principle from the start. All spaces within the Center must meet and exceed the latest federal regulations for accessibility. Additionally, the project committed to not block access to, nor diminish the quality of, fresh air, sunlight, and natural waterways for any member of society or adjacent developments. Brock's site consists of approximately 195 meters of shoreline on the Lynnhaven Inlet. The project strived to maintain unfettered access to all of the existing pathways that follow the shoreline. Aesthetic Goal: While the ambitious environmental goals like resource efficiency, performance, and passive design strategies were powerful forces that would shape the design, the project also sought to make the center beautiful and compelling — a memorable place that draws visitors in and celebrates the client's mission and site. Another aesthetic consideration was to embrace biophilia, the concept that human beings have an intrinsic bond with living systems. The team pursued a design inspired by natural forms, colors, materials, textures, and patterns that connects visitors and staff to nature, enhancing a sense of well-being. Cost-Effective Goal: CBF's desire to create a replicable example of sustainable design, combined with their nonprofit mission, required the team to work towards a design solution that would be cost-effective. LBC/Net-Zero Energy goals altered the design team's approach to Life-Cycle Cost Assessment (LCCA). The cost benefit of conservation approaches was measured against the cost of on-site renewables, rather than the cost of cheap, grid-provided electricity. This approach put an increased emphasis on conservation. Historic Preservation Goal: While there were no existing buildings on the site, celebrating the cultural history of the region and the site was part of the project's biophilic goals. The design seeks to strengthen its connection to nature by celebrating its sense of place, connecting to the historical and cultural vernacular and spirit, as well as the one-of-a-kind site, the last undeveloped large privately held land in Virginia Beach. Aerial view of the site and detailed site plan. Productive Goal: The Brock Center sought to demonstrate that Net-Zero Energy and aggressive conservation does not compromise staff productivity. CBF sought to create a highly productive and collaborative work environment for the staff of 25 who work each day in the Center. Both staff and tenants previously worked in a traditional, closed-office, work environment. The mission of both staff and tenants also centers on partnerships and collaboration, so the design team was tasked with creating a more collaborative, effective, productive, healthy, and connected interior environment. Project goals included providing every occupied space inside the Center with daylight, views, and an operable window to connect occupants to the exterior. The design also sought to create superior indoor air quality by avoiding materials with toxic ingredients including a list of over 300 chemicals known for human health hazards, called "the red list". Other Significant Aspects of the Project: Creating an environmental regenerative, beautiful, productive design alone was not enough. In keeping with CBF's advocacy mission, the team also sought to create an example that catalyzed policy and codes to embrace more sustainable practices. CBF recognized the project's potential to break down regulatory boundaries so that others may follow their example. Once the team was assembled and the vision was established, all project stakeholders participated in benchmarking tours, visiting other projects pursuing the Living Building Challenge and meeting with those teams. Benchmarking helped to undercover roadblocks when implementing the lofty vision established earlier. These lessons led the team to start early when vetting material selections, to engage State agencies early for regulatory challenges (such as Net-Zero water), to understand occupancy behavior during design, and to embrace transparency of process. An iterative design process based on performance simulation allowed the team to integrate and optimize strategies. For example, daylight simulation was used to tune window size and location, glazing properties, and sun-shade depths until simulation demonstrated uniform and adequate daylighting. HVAC systems were assessed using a Life-Cycle-Cost approach to identify systems that were environmentally, aesthetically, and economically consistent with project goals. The team also sought to address life-cycle impacts of the building by minimizing material manufacturing impacts by incorporating salvaged materials extensively. Maple floors from a local gymnasium were transformed into interior flooring. All interior wood trim was made from salvaged school bleachers. All wood doors, cabinets, countertops, mirrors, sinks, toilet accessories, lockers, etc. were salvaged from local demolition projects. Cabinet pulls were made from salvaged champagne corks. The wood siding was milled from cypress "sinker logs"-remnants from 19th century logging, recovered from the bottom of rivers centuries later. In order to achieve a true zero carbon building, in addition to the Net-Zero Energy goal, the embodied energy of constructing the Brock Center was calculated using the Athena Eco-Calculator. The Owner purchased 1,234 metric tons of carbon offsets through Sterling Planet to support a Landfill Gas to Energy project in Dartmouth, Massachusetts, to offset the environmental cost of construction and materials. Brock reunited CBF and the design team responsible for their game-changing Merrill Center, the world's first LEED Platinum certified project. This longstanding relationship allowed the team to draw on lessons learned, having stayed closely connected to the Center's performance. The ambitious goal to achieve LBC certification led to a collaborative process centered on transparency, hoping to create a replicable process and example for others to follow. A full-day, on-site charrette included all design disciplines, local officials, community representatives, and outside experts, to formulate a shared project vision. Site and climate analysis uncovered the site's wind potential, while revealing the site's ecological function, emphasizing its potential to filter stormwater from beyond its own boundary. The contractor was brought on early in design and remained actively involved during design. Strategies were formulated, modeled, and refined iteratively in increasing detail, including envelope optimization, HVAC LCCAs, daylight simulation, and airflow modeling. Net-Zero goals required intense collaboration with end-users to anticipate the building's actual operation. Having architecture and MEP engineer co-located facilitated integration. The challenging LBC Materials Petal resulted in a "red-list" charrette held during schematic design, allowing client, architect, contractor, and interns from local schools to develop shared online methodologies for materials vetting. The team partnered with James Madison University to optimize the wind turbine design, and with the US Fish & Wildlife Services to ensure a bird-safe solution. Conversations with regulatory agencies began during early design and spanning construction, enabling the unique achievement of using rainwater for potable uses. Visitors proceed up an entry ramp that elevates the Center from the floodplain below. The adjacent roof forms recall the wings of a gull, while embodying rainwater collection. All excavators, generators, and forklifts were fitted with "dry scrubbers," reducing fossil fuel use and emissions. Two mobile photovoltaic arrays powered construction and onsite temporary offices. The MEP and Building Enclosure Commissioning team were engaged from design throughout construction and operation. During construction, much salvage was used to eliminate production of new materials. Materials were optimized and re-purposed to the greatest extent possible. Concrete waste was reused as crushed aggregate for the entry road. Wood scraps were re-used for wall blocking. Foam insulation scraps were returned to the factory to be reborn as new insulation. Overall, more than 95% of the construction waste was recycled. For operations, there is a strong policy of conservation, reusing, recycling, and composting everything, from kitchen scraps to toilet waste. Stakeholders collaborated to tune building systems to ensure Brock was on track to reach LBC Certification. The team remained actively involved monitoring performance daily during Brock's first year. A local university conducted an on-site assessment including thermal comfort, IAQ, lighting, and acoustics based on occupant IEQ satisfaction surveys along with field measurements of IEQ parameters including temperatures, humidity, CO2, illuminance and sound pressure levels. Other Tools: The design was marked by a highly iterative, integrative process using simulation tools, including Sefaira, IES, and AGi32 to validate each design move. Having all design disciplines and the construction manager working on a shared BIM model, helped to facilitate integration and coordination. The design's sustainability aspirations and open, exposed layout benefited from this approach. The open configuration of the Center's conference room allows flexible furniture arrangements to accommodate a variety of educational activities. An operable wall to the south opens onto the deck beyond, blurring the separation between inside and outside. The south deck swells in plan adjacent to the conference room, creating a large gathering space for formal and informal gatherings, with unmatched views to the Bay beyond. Brock's design was not only informed by resource efficiency, function, performance, and resilience (as described throughout this submittal), but also to make the Center beautiful — a memorable place that draws visitors in, celebrating CBF's mission and site. The Center's westernmost portion is highly prominent — an opportunity to engage those who arrive and to excite them to see more, providing a threshold to the exquisite landscape beyond. Its design sought to create something iconic and beautiful, capturing the spirit of CBF and the site. Prominent, curving roofs recall forms of the site's windswept live oaks, the wings of a gull (CBF's logo), and the protective shell of an oyster. The zinc shingles that clad the composition recall fish scales, adding texture and interest. Their subtle reflectivity catches the light, shimmering like the Bay itself. The exterior palette of zinc shingles and sinker-cypress siding reflect the color and textures of the site. Sustainable design strategies resulted in a very long building form. To avoid the look of a long interior corridor that provides circulation from end to end, the Center curves in plan, so one ever sees the end of the corridor until you've navigated near its end; instead, the convex shape draws one's focus outward, connecting to nature while compelling guests to explore the building's length. Salvaged materials all had a unique story and were incorporated in a manner to celebrate their past lives. Rather than refinishing salvaged wood bleachers from a local high school (incorporated into new wood trim), instead they were left imperfect - students' carvings and bolt holes intact giving clues to their former life. Maple gym floors were salvaged and refinished with the exception of one room where the strip planks were left in their original state so visitors can appreciate their former history. Cabinet pulls and artwork in the staff dining room utilized champagne corks salvaged by local neighbors and staff during the design and construction of the center. These corks hold the memory of celebrations and the collective contributions of the community that surround the Brock Center. These details are rich with memory, contributing to the sense of delight and the celebration of culture, spirit, and place. Brock has produced over 80% more energy than consumed since 4/1/2015. After optimizing passive design measures, demand is met using high-performance equipment and controls. A VRF HVAC system, coupled with a dedicated outside air system, utilizes 18 ground-source wells, improving heating and cooling efficiency. Occupancy/vacancy sensors control lighting, ventilation, and plugs (reducing "vampire" loads). Energy Star copiers, computers, and appliances are used throughout. Brock's remarkably low EUI (14 kBTU/sf/yr) is met and exceeded by grid-tied, on-site renewables. Two 10 kW wind turbines book-end the Center, located to minimize turbulence. A 45 kW photovoltaic array sits atop south facing roofs. Actual energy consumption and production during the first year of operation was within 1% of predictive models. A steady surplus of energy production throughout the year has led to a net-positive energy balance every month. Domestic Hot Water: Not metered separately, in "Other End Use" below. Other End Use: 4,287 kWh (Hot Water and other unaccounted loads). Peak Electricity Demand: 330kWh (peak daily consumption), ~50 kW peak electricity demand. Comment on Data Sources and Reliability. Energy data provided above is from metered data from the Building Management System and was corroborated (to demonstrate the project achieved Net-Zero Energy) using electric utility bills. The Center uses natural ventilation and daylighting to provide lighting and passive cooling for all public spaces. A white, acoustical metal deck ceiling and high, north clerestory windows maximize daylighting effectiveness. The building's shallow (33' deep) footprint facilitates the effectiveness of both daylighting and natural ventilation. The primary circulation corridor along the south edge buffers workstations from direct daylight and cool breezes, extending the natural ventilation season. Materials' ingredients were documented to ensure no LBC red-list chemicals were included in the Center. A local university conducted an on-site assessment including thermal comfort, IAQ, lighting, and acoustics based on an occupant IEQ satisfaction survey, along with field measurements of IEQ parameters including dry-bulb and globe temperatures, humidity, CO2, illuminance, and sound pressure levels. View of open office areas showing clerestory windows that provide ample daylight and release rising hot air. Ceiling fans promote airflow during the natural ventilation season. Interior forms and finishes reflect daylight, creating even natural illumination. The Center was designed to withstand the test of time. Situated on a coastal site, the design anticipates sea-level rise and coastal impacts. Brock is set back 200 feet from the shore and is raised fourteen feet above sea-level, anticipating future storm surge impacts associated with sea-level rise. Its steel structure, laminated glazing, and cladding are designed to weather hurricane impacts and wind-borne debris. Zinc shingles and thick, galvanized-coated steel resist corrosion from salt-spray, and old-growth, heart cypress siding was selected for its natural ability to resist rot. Long-life interior finishes like wood floors can last a century without needing replacement. Small battery back-ups maintain emergency lighting, security, and composter exhaust for multiple days to withstand most power outages. Brock is also Net-Zero water, using treated rainwater for all uses including rainwater. Cisterns are sized to withstand 6 weeks of drought. These assets, when combined with Brock's ability to maintain a comfortable setting without reliance on power, provide passive survivability for both CBF and its community. The Center's anticipated longevity necessitated considerations for flexibility. Open, loft-like workspaces and benching-style furniture can easily be reconfigured to accommodate growth and change. The movable furniture in the Center's conference room can be arranged to suit a variety of purposes including lectures, community meetings, and hands-on demonstrations. Operable glass walls can expand the room to the outside deck, doubling its capacity for larger events. If the Center's usage or population grows over time, roof areas and solar inverters can accommodate future PVs allowing the building to remain Net-Zero. 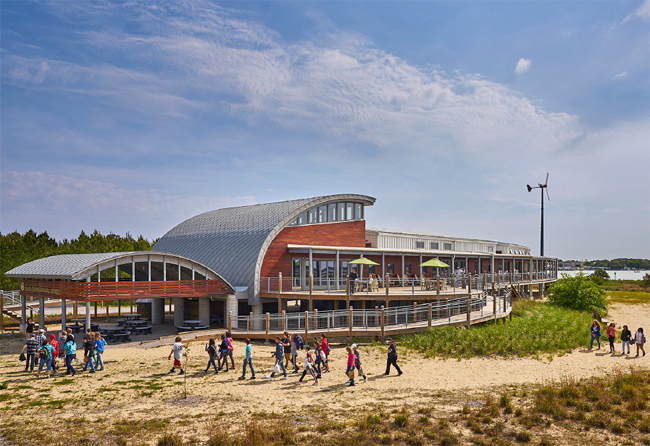 Thousands of students visit the Brock Center each year to learn, observe, and participate in the Chesapeake Bay's ecology and how buildings can work in positive ways to preserve and enhance the environment. Accessible: Brock's neighboring community has unrestricted access to the entire preserve and shoreline. Brock's 70' tall wind turbines don't cast shadows that leave the property nor do they shade adjacent structures. The one-story building is raised above grade with prominent ramps ensuring effortless accessibility for all. Aesthetics: The concept that beauty reflects and celebrates nature was a core tenet of both the design team and the client, and the Center's beauty has been recognized with AIA Honor Awards within the region. Cost-Effective: Excluding sitework costs and the premium to elevate above the floodplain, Brock's construction costs were just over $400/sf (including renewables). The Living Building Financial Study, found LBC-certified, mid-rise office buildings in hot-humid climates incur a premium 26%–31%. Brock's cost premium was in this range. Functional / Operational: The Center itself is an educational platform for all participants to learn and act responsibly. Since opening, CBF has had over 30,000 visitors tour the Center, resulting in an exceptionally informed and inspired constituency that values the Bay and its watershed as a living, connected system. 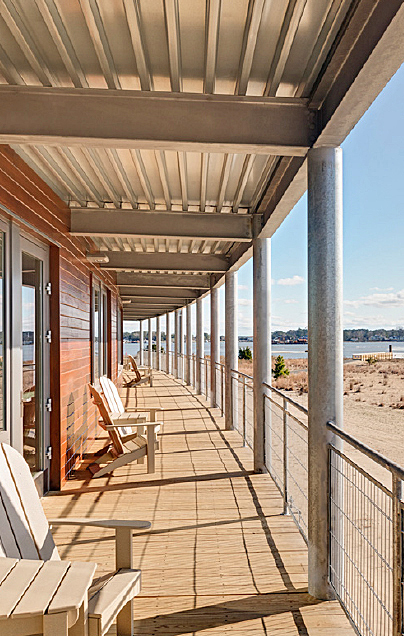 Mimicking the curving shoreline beyond, a continuous porch along the south facade shields the interior from unwanted solar heat gain while providing a spectacular setting to view the marshes and Bay beyond. Historic Preservation: The design celebrates regional and cultural vernacular and its unique setting. Features like porches, elevated floorplates, tall ceilings, and a "dog-trot" (an open air pass-through and vernacular design element) are examples. Productive: An IEQ assessment demonstrated that low-energy buildings can deliver high productivity and comfort. The survey of occupant satisfaction with thermal comfort, air quality, and lighting were higher than comparable benchmark values — notable considering the building uses natural ventilation and daylighting. Brock's natural ventilation system provides similar thermal conditions as mechanical cooling, for 70–90% less conditioning energy. Secure / Safe: The Center thrived during Hurricane Joaquin, its first hurricane and accompanying storm surge that brought sea-level above the base of its piers. Brock not only successfully weathered the storm, but also leveraged high-winds to produce a surplus of power. Sustainable: Beyond its LEED Platinum certification, Brock was awarded full LBC Certification in May 2016 (the 11th LBC certified project in the world) demonstrating its Net-Zero Energy, Water, and Waste achievement, meeting all of the rigorous requirements of the LBC. The preservation of Pleasure House Point saved this once-private parcel from over-development, transforming it to a public, preserved natural area serving the local Ocean Park community and the City of Virginia Beach (CVB). Until the 1960s, Pleasure House Point was an intertidal marsh, providing valuable habitat for plant and animal life. In the 1970s, dredging the Lynnhaven Inlet resulted in extensive spoils deposited on site, significantly reducing wetland vegetation, manipulating land to make it "developable". Naturally-occurring wetlands have reestablished along the shoreline. Former marshes filled with dredge spoils are experiencing ecological succession into vibrant salt meadows. Old-growth maritime forest remnants that border the site's northern edge remain. Twenty-eight species of birds are found on site, four on the Audubon Watchlist. The northern diamond-backed terrapin, a species of concern, uses the property for nesting and foraging, primarily within one hundred feet of the edge of the tidal waters. The Brock Center was sited to minimize impact to the successional landscape, limiting development beyond a 200-foot setback of wetlands/shore, clustering site elements along the edge of the successional maritime forest. Existing trees were preserved. Aggressive limits-of-disturbance were established to minimize impacts to the site during construction. A master plan for CBF's parcel and adjacent natural areas will guide the restoration of the site back to thriving ecosystems. Other than three ADA spaces, there is no parking on site. The existing road, previously improved in anticipation of large-scale site development, was converted to provide on-street parking for visitors. A wooded path connects this area to the building. Shuttles take visitors to the Center during larger events. CBF partnered with CVB to create new community parking north of the site, including preferred spaces for fuel-efficient vehicles and carpoolers. The "Dog-Trot" - an open-air pass-through. The Brock Center's one-story, long and narrow footprint oriented on an East-West axis maximizes opportunities for daylighting and natural ventilation. The long bar curves slightly to the east, allowing morning sun to preheat the interior office. The exterior envelope was optimized (R–31 walls, R–50 roof, R–7 triple-glazed/argon-filled windows) to significantly reduce heating demand. To minimize cooling loads, windows were carefully placed and frugally sized (25% window-to-wall ratio) to provide optimal daylight, views, and ventilation, without excessive heat gain from over-glazing. A porch lines the south façade sheltering the interior from unwanted solar heat gain, while large clerestory windows on the north façade provide glare-free daylight. There are no west-facing windows. The interiors are open and loft-like, with 20 foot ceilings at their peak, promoting daylighting and both natural stack and cross ventilation. The long floor plate is interrupted by a "dogtrot" — an open air pass-through, recalling vernacular architecture of the Southeast. The dogtrot uses the building form to intensify breezes creating a comfortable micro-climate, while also promoting airflow throughout the Center to reduce horizontal stratification. The Center uses natural ventilation and daylighting to provide lighting and passive cooling for all public spaces. During design, simulation tools ensured that window glazing, configuration, size, and location optimized daylight, views, and ventilation without creating glare or unwanted solar gain. A white, acoustical metal deck ceiling and high, north clerestory windows maximize daylighting effectiveness. Artificial lighting layouts parallel furniture, providing efficient lighting at work surfaces without over-lighting corridors. LED task lighting is provided at all workstations. The building's shallow (33' deep) footprint facilitates the effectiveness of both daylighting and natural ventilation. The primary circulation corridor along the south edge buffers workstations from direct daylight and cool breezes, extending the natural ventilation season. Bi-directional breezes are captured with low inlets and high outlets on both North and South facades. Airflow modeling predicted the building can effectively maintain comfort using only natural ventilation for 11% of the year. When sensors determine climate suitability, mechanical cooling shuts off and automated controls send an email to staff alerting them to open windows, using a combination of hand-crank and motorized operators. Motorized windows allow night-flush of the interior to pre-cool the interior during cooling-driven months. Whenever possible, natural materials from the U.S. Southeast (wood, uncoated metals) were selected to reinforce a sense-of-place, while reducing chemical constituents. Materials' ingredients were documented to ensure no LBC red-list chemicals were included in the Center. Products were locally sourced (500 km radius for dense materials) and the vast majority of materials, like wood siding, zinc shingles, drywall, lighting, mechanical systems, appliances, and finishes are all US-made. Salvaged building products were used extensively and celebrated within the design. The building enclosure features rainscreen construction to maintain the cypress siding's durability, while providing continuous air/vapor barriers and insulation. Wood framing minimized thermal bridging. All virgin (non-recovered) wood was FSC-certified. Building Enclosure Commissioning validated strict infiltration limits. 95.9% of all construction waste was diverted from landfills. Beyond Net-Zero Energy, Brock is on track to be truly Net-Zero Water, possibly the first in the US to receive a commercial permit for drinking treated rainwater in accordance with federal requirements. Two standing seam metal roofs capture rainwater, filling two 1650–gallon cisterns, enough to withstand 5–6 weeks of drought. Rainwater is filtered (four log filters) and disinfected (ozone and UV, chlorine was subsequently added and CBF is appealing this requirement), and supplies all water uses within the Center. Composting toilets reduce water demand while also treating waste on-site. Solid compost is used on-site, while leachate is stored and sent to a local struvite reactor and converted into commercially available fertilizer. Greywater from sinks and showers is piped to a greywater rain-garden (raised above sea-level) that treats the water, allowing it to infiltrate. Excess roof runoff is diverted to raingardens that naturally filter and infiltrate runoff, managing all stormwater on site. All hardscape is composed of permeable pavers and gravel, with adjacent rain gardens and bio-swales to treat runoff, allowing for infiltration. All landscaping is native to the region. The design includes a City-owned parking area north of the site that features low-impact design strategies, which has become a model for future City projects. Throughout all phases of design, strategies were formulated, modeled, and refined iteratively in increasing detail, including envelope optimization, HVAC LCCAs, daylight simulation, and airflow modeling. Net-Zero goals required predictive modeling and intense collaboration with end-users to anticipate the building's actual operation. Building enclosure and MEP systems commissioning validated that design targets for infiltration, air quality, and full-systems were functionality met. The team remained engaged during Brock's first year of operation. Sub-metering by end-use allows the team to track energy/water use and production against targets established via predictive modeling. Each day, the Building Management System (BMS) provided data on the resource consumption and production from the previous day. These data were compared to predicted values established by the energy and water model, ensuring the building was performing as predicted; and allowing the team to uncover potential performance problems before they derailed the pursuit of net-positive energy and water. Lessons learned from monitoring include new methods to manage the intrinsic corrosivity of rainwater; how daily energy reports and dashboards can diagnose problems; how to balance staff comfort with energy conservation; natural ventilation effectiveness in hot-humid climates, etc. A local university is currently conducting an on-site assessment including thermal comfort, IAQ, lighting, and acoustics based on an occupant IEQ satisfaction survey along with field measurements of IEQ parameters including dry-bulb and globe temperatures, humidity, CO2, illuminance, and sound pressure levels. Living Chesapeake: The Brock Environmental Center, Ecotone, March 2017. "Brock Environmental Center Vindicates Onsite Wind Generation," Building Green, June 2016. "Lessons from a Living Building: The Brock Environmental Center," Architect Magazine, June 2016. "Brock Environmental Center: Strong through the Storm," by Brian Coffield, Sara Lappano, Greg Mella. High-Performance Buildings Magazine, Summer 2016. "In Search of Transformation: Merging Sustainability and Resilience for the Brock Environmental Center," Trim Tab, Winter 2013.